Available as an app, online, and in print. Subscribe to The Lutheran Witness and download the app to get the latest issues delivered directly to your iPad, iPhone, and iPod Touch. Learn more. 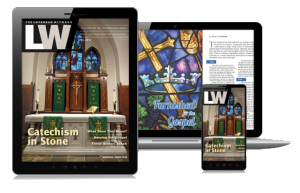 The flagship magazine of the Lutheran Church—Missouri Synod, The Lutheran Witness is a monthly publication (11 issues per year) that offers synodical news, features, columns, Q&A’s, and more.